The opera Gods are smiling on me. I had such a grand time at the Deutsche Oper Zauberflöte last week … it was deliciously clean and clear and unfussy, so played and sung for the piece, rather than for some star guest … and, well, I didn’t expect to get served up a second helping of the same quite so soon. And Lucia di Lammermoor is rather a different kettle of kippers to Mozart and Shikaneder’s fanciful Singspiel. My last Lucia was – wait for it – a dress-rehearsal, in 1968 or 9, at Covent Garden. I forget who was supposed to be Lucia, but she didn’t deign to do dress-rehearsals so I saw understudy Maria Pellegrini with the young Giacomo Aragall. Consequently, I decided it was probably better as an excerpts recording rather than a staged opera. How wrong can you be. Tonight proved that. Lucia is a splendid stage piece. There are umpteen versions of the piece. I don’t know which one this was, but it has Alice in it so I guess it’s the original. With slimmings? If so, they are good slimmings. The libretto is not too bad: I wish we had had Ashton’s reasons and excuses in scene one, rather than later, when we’ve decided he’s just a ghastly horrid sibling. But the story is all there, just in an odd order. But never mind. It’s a 200 year-old opera; its not supposed to be Tom Stoppard or Larry Gelbart. And the music … almost as many pops as Trovatore. Wonderful. So why did I so enjoy it tonight, when I really hadn’t before? Because it was produced and played with absolute clarity, and the opera itself came shining through. Filippo Sanjust’s production dates from 1980 – see, the good productions last, while the campy ones vanish – and, though one can find things to be picky about, more than 30 years later, it is attractive, helpful and never annoying. Yes, 'annoying' is a hazard of the operatic theatre these days! I must, in all honesty, admit to the odd query and giggle. When the front curtain was revealed, I thought I’d come to the wrong opera: La Dame Blanche! Well, that would have been nice, too! And the costumes? Attractive in themselves, but … oh! all that matching white linen! Obviously the Ashtons and Ravenswoods and Arturo all have the same underwear-manufacturer and laundress. The jellyfish around everyone’s ankles dazzled me! But that’s what happens when you have choruses, especially one all dressed in the same – admittedly pretty -- frock (it reminded me of Gilbert and Sullivan!). I’m having an anti-chorus season, actually, they plonk on, they plonk off, and you have to remind yourself that this is an operatic convention. Paulie came up with a good idea tonight. Put the orchestra at the back of the stage, and the chorus in the pit. Think what you’ld save in costuming, and what you’ld gain in audibility for the singers. Last quibble. Conductor Ivan Repusic kept his (bigger than for Zauberflöte) band hugely and beautifully under control, but several of the singers were a little drowned. Right. And now to the joy. Because it was a joy. The evening. The opera. Largely because we were allowed to hear and see the opera. Not an evening built around Callas or Sims Reeves or Sutherland. The opera. If you haven’t already guessed, I am not a star-chaser. Sure, I enjoyed seeing Gruberova in Lucrezia Borgia here a couple of years ago, but I went to see Lucrezia Borgia not Gruberova. I like my opera sung and acted as she is writ. Even those rusty old libretti … have faith in them! And tonight’s production and players did. The piece is really a three-hander. Lucia, her lover and her mixed-up brother (potentially the most interesting character, but Donizetti and Cammarano didn’t make him so). In a ‘starry’ production, one of these three – usually two --- would be made to stand out. Not tonight. The infernal triangle was vibrantly three-sided. As it should be. Lucia was played and sung by Hulkar Sabirova, whom we had seen as a hausfrau-ish but vocally brilliant Queen of the Night. Well, Lucia is a much better role than Astrafiammante, but Miss Sabirova was amazingly better. Not that she was bad last time! This is Lucia as I would want to see it ideally played. Her acting of the role was wholly believable: this really was the young Scots maiden, in love and in terror. No foolish exaggeration. When she went mad, she went gently mad. No tearing of the hair. When she loved, you could feel it … and Cammarano doesn’t help with those stagey false exits! As for the singing, all I can say is YES. This Lucia doesn’t treat ‘Regnava nel silenzio’ and the mad scene arias as well-known vocal showpieces. She treats them as part of the story in progress. And sings them with a sweet, meaningful accuracy which is totally winning and convincing. I was wholly won. What can I say but yes, yes, yes. Edgardo is an awkward part. The ‘story so far’ doesn’t really establish his family and the feud well enough. So he gets to sing a big duet in scene 2, the top tenor line in the sextet, and then he has to wait till the final scene when he gets his big aria, and the whole scene and final curtain to himself. Yosep Kang was a fine Tamino, but he is a much better Edgardo. From his first entrance, he sang freely and acted convincingly, in his big scene (‘Fra poco’ and suicide) he was quite splendid. Ashton is a horrid part. Partly because he is clumsily written, and partly because the others get all the bon-bons (until the sextet arrives). Bastiaan Everink looked splendid, sang strongly, and did all one can do with the part. Well, what else can you do? The lesser roles were well-taken: Marko Mimica made the most of his moment as Bide-the-Bent, Katarina Bradic played Alice so nicely you wonder why the French cut her out, and Matthew Newlin was a handsome tenorious bloody bridegroom. And of course, those two ‘actors’ in the pit: harpist Virginie Gout-Zschäbitz and flautist Eric Kirchhoff. Have I sufficiently explained why I liked this evening so much? 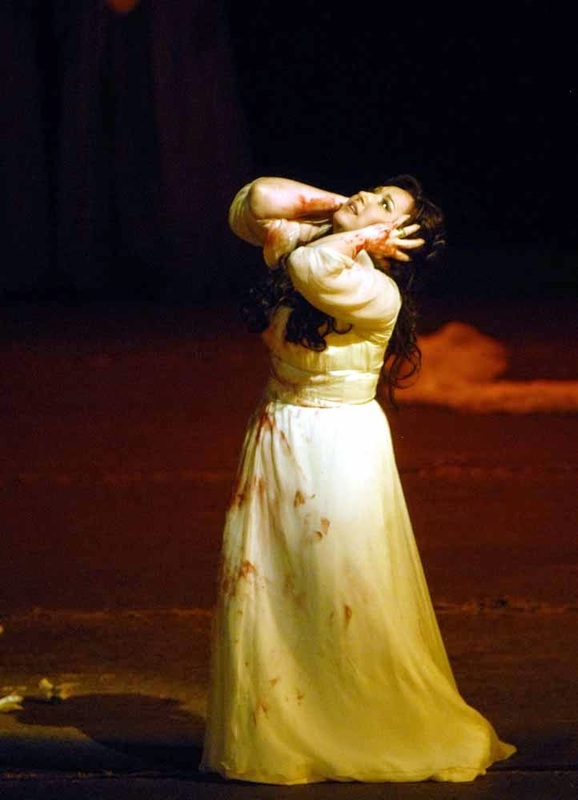 Well, apart from anything else, now I feel I know Lucia di Lammermoor. Not just the bonbons, the opera. Thank you, everyone.